Hole #16 Tee: The basket is over the hill, beyond the Martin House. 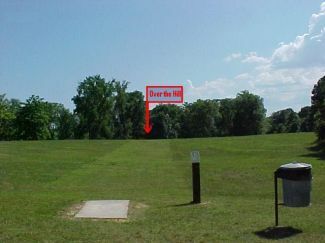 Description: Located within a park setting, the course meanders through numerous hardwood trees. Grass is mowed roughly every 10 days with special emphasis on mowing the fairways close. Portions of the course cross water, especially in the spring, while a couple of holes venture into the forest. Local Directions: From I-55 take the I-69 west exit. On I-69, drive 9 miles west to the Highway 301 - Arkabutla Lake exit. On Highway 301, drive 6 miles south to Pratt Road. Turn left and drive 2 miles east to Arkabutla Dam. The Lost Indian Spring Disc Golf Course is to the right.